At one of the many magnificent views on Skyline Drive. I may have been on Skyline Drive in Virginia before, perhaps driving part of it with friends visiting from out of town 20 years ago. But I now know what a magnificent road it is, and why more than a million people every year drive at least part of its 105 miles. Most of them do this in cars. I’ve joined the people who’ve traversed its entire length in both directions on a motorcycle. Turning into my driveway Sunday afternoon after my two-day journey, I exhaled after having completed 405 miles. No big deal for experienced riders, but I’m a newbie. 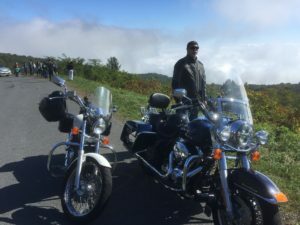 I wanted to find out whether I could actually do real travel on two wheels. A half-million motorcycles are sold in the United States every year. The Motley Fool estimates more than 8 million bikes are registered for street use in the United States. So I wasn’t discovering anything new, just new to me. I wanted to see if I could do it. Motorcycle accident statistics, at least those cited by public authorities who control licensing, indicate people are most likely to crash within the first six months of riding. This past weekend marks, within a few days, six months since I registered my bike, a couple of weeks after getting my license in March. At least statistically, I’m out of the red-zone of danger. I was going to do it alone. Set out from Rockville early Saturday morning, find my way to Front Royal, Virginia, where Skyline Drive starts. Then I’d do Skyline Drive, spend the night, then do the reverse trip Sunday. I even booked a motel in downtown Waynesboro, Virginia, where Skyline Drive terminates. Luckily my friend Tom, an experienced, long-term rider and one my biker mentors, intervened and texted me, asking if I’d like company. Having done Skyline several times, Tom knew the great back roads to get to Front Royal. He even knew the way to the motel at the other end. Beyond all that, I think he knew I’d need expert advice and guidance. Turns out, I did. We probably looked like a motorcycling Batman and Robin. Tom rides a magnificent Harley Davidson with all the trimmings, including a remote-controlled GoPro. It’s the Buick Roadmaster equivalent of motorcycles. I ride a third-hand Honda Shadow that looks like a miniature Harley. My bike’s engine, at 600 cc, compares to 1700 for the Harley. My whole contraption weighs half as much. Every rider I know told me mine’s a great “first bike” … but I’d want a bigger one in six months. Thus we met at a gas station equidistant from our houses at 7 Saturday morning and zoomed off. My bike is loud for a smallish Japanese motorcycle, owing to the after-market exhaust pipes the previous owner installed. They’re like anti-mufflers. I learned you don’t just grimly grind out the miles. The wind, the noise, and constant concentration required of driving a motorcycle are fatiguing. I’m still something of a cautious rider. I get performance-adrenaline just putting on my riding gear. So maybe I have more tension than experienced riders. I accommodate my lack of experience by taking the corners and sharp curves slower than seemingly every other rider. So sometimes Tom and others I’ve ridden with quickly put a quarter mile or more between us. They then have to slow down periodically to let me catch up. Anyhow, Tom encouraged stops every hour or so we could get coffee, pee, have a snack, to just experience some quiet. Otherwise, the miles flew past, the autumn trees and farms in their burnt tones a blur. Hawks overhead, cattle, road kill … you don’t just see what you’re passing but also smell it and hear it. You also experience the weather. We donned rain gear at one point because of the drizzly fog on Saturday. When I later took off my baggy rain pants, though, I discovered the exhaust pipes had melted large holes in the inseam of the right leg, leaving black residue on my shiny chrome. At the entrance to Skyline Drive, we showed our National Park Service seniors passes, which let us in free. 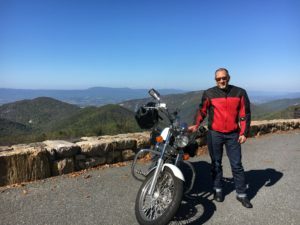 Gunning up the mountain to the first ridge and passing the first vista lookout, I thought to myself, “I don’t believe I’m doing this.” Several hours of endlessly twisting road — on utterly flawless pavement — we rode sedately into Waynesboro. We’d completed more than 200 miles. The clerk at the hotel made sure we had a room in the quieter back, where we could park our bikes just outside the door. “We like to take care of our motorcycles,” she chirped. Indeed, half the occupied spaces at the motel contained bikes. We walked a block down behind the motel to where a little street festival was going on in downtown Waynesboro. We listened to the band for a few minutes and had some local beer. 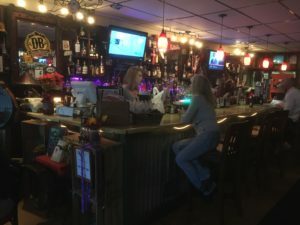 Then burgers and more beer at a tavern where someone cares about both the food and the libations. I slept like a rock, perhaps aided by a nightcap of Makers Mark nips. Sunday morning we ate waffles and coffee at the motel, repacked the saddle bags, checked out, rode two blocks to gas the bikes, and re-entered Skyline Drive at mile 105. From the there the mile markers count down towards Front Royal. We rode through nearly opaque fog until we ascended to a lookout from which we could look down on the clouds. Thereafter we had cloudless sunny riding. Reaching Front Royal, I realized I was getting fatigued in the saddle. Yet we had 80 miles to reach home. On that stretch, I made a few mistakes. I nearly dropped my bike negotiating a turn onto a busy road, trying to roll slowly one way and look the other way at the same time. I took a left into traffic coming from both directions, when I should have waited for a bigger opening. But I settled in for the last 30 miles or so, following Tom fairly closely on 50 mph Maryland Route 28, ’til abruptly you’re in the busy part of Montgomery County. We parted company at Darnestown Road, where I headed towards my end of Rockville and Tom to his. Four hundred five miles altogether. I gunned the engine in the driveway to let Robin know I made it home in one piece. I felt like I’d accomplished something totally new. Motorcycle requires a healthy respect for the risks, plus mental and physical strategies to mitigate them. But the matchless beauty and just plain fun of experiencing the world on two motorized wheels, well, so far it’s worth the effort. Can’t wait until I’m your “Tom”, Tom. Hell, you’ll probably be mine then! 2020 – Miami to Key West!